You would expect that 7th and 8th grade students would be interested and impressed with stories about space from NASA Ames Chief Scientist, Dr. Jacob Cohen. 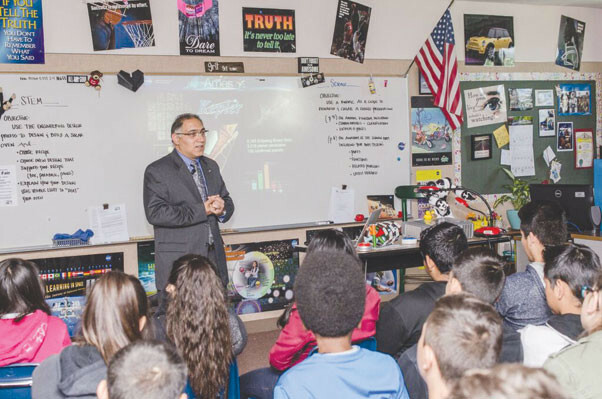 Maybe you wouldn’t expect that they would laugh, engage in reciprocal discussions and leave with life lessons, but that is certainly what occurred during a presentation April 30 at Desert Willow Intermediate, which is part of the Palmdale School District. Co-presidents of the STEM classes, Marcus Williams (8th grade) and Arlene Salvador (7th grade) started the event with a short presentation of student learning from recent STEM research projects. Cohen supported their research by helping to establish authentic contacts with STEM-related innovators, providing students with direct contact with founders, CEOs and innovators. Students developed PowToons and reflections on learning were shared with Cohen prior to his talk. 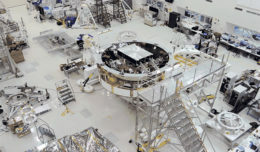 Cohen used space exploration, past and current, to engage the students in discussions about where we have been, where we are and where we are headed. NASA missions were introduced that helped the students to understand exoplanets, the habitable zone, the impact of Hubble Telescope, microgravity related research and where we are headed next in space exploration—Mars! Even more, students were challenged to look within to figure out their own place in the story and to bring to that imagination, persistence and compassion. The student’s instructor, Kathleen Fredette, believes that introducing students to authentic NASA and STEM professionals is potentially life changing for young students.